Blurb: Midwinter. A child is found wandering through the snowy woods, her hands covered in someone else’s blood. Authorities suspect the child is the kidnapped daughter of real estate tycoon Michael McLaughlin. Once they realize she is far too young to be the missing teenager, they reach a dead end in identifying the girl, who either cannot or will not speak. The only adult she seems to trust is the young officer who found her, Detective Lucy Black. 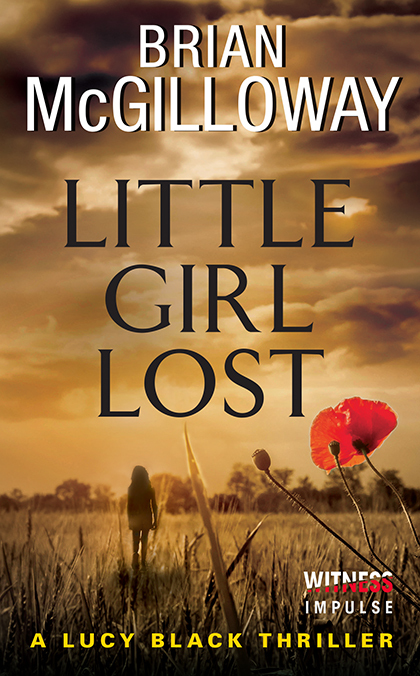 A frenzied investigation to find the McLaughlins’ daughter and to discover the name of the mysterious child is ignited when it becomes apparent that the two cases are linked. As Lucy digs deeper and deeper into the case, she is forced to question not only the persons of interest, but everything she thought she knew about her own past. I had come across this book randomly on Edelweiss one day and my interest was piqued. Honestly the first time I saw it, there was no book description. All that was there was the book cover. This book’s cover really is what caught my interest (I’m not normally a big cover person). Maybe a week later my contact at William Morrow sent me more information on this book and I immediately clicked the link she sent through for direct access to the book. I loaded it onto my Nook the day Bout of Books started and I was off reading. The first few pages in I had determined that this author must really have an issue with spell-check. I was a little concerned until I saw the tell-tale “our” on the end of a word instead of the American “or” version. That was finally when I realized that it’s okay that “curb” was spelled “kerb” and “pajamas” was “pyjamas.” I guess I should spend a little more time reading what publicists send me so I know that I’m actually reading a European author write a book set in Ireland! Actually it’s pretty sad because when I look back at the email I was originally sent the subject line actually reads: “#1 UK Kindle Bestseller now available by Witness.” Um, yeah, Tara … you could be a little more observant! Anyway, I guess I should really stop with the rambling and get on with the review. So, I will say that I was immediately taken with Lucy Black’s character. She just seemed to spunky and fresh. And you knew immediately that she was dealing with some personal issues as well. Her father is suffering from Alzheimer’s and she has moved back home in order to care for him. Her relationship with her mother is very seriously lacking. And she’s trying to settle into a new job in a new department. So what happens? She dives straight into a case and starts finding connections that some people don’t want to be made. Lucy is such a compassionate character – she really has a way with children and she’s a saint for what she deals with in regards to her father’s failing condition. She’s just a really likable character. I am also interested in seeing how her mother’s character is fleshed out in the future books. The door is open for them to have more of a relationship, I hope that it happens for both of them. The writing itself was very good and the storyline was really interesting. There were a lot of twists and turns along the way. And when Lucy finally came to figuring out the entire thing, well in order to avoid spoilers, let’s just say that you will probably be surprised with how things end up unfolding. I especially liked how the storylines ended up weaving in together. I spent the majority of the first part of the book trying to figure out how the two cases were going to come together, so it was very interesting to see how they finally did – and not entirely surprising, either. I’m excited that this is the first in a new series. I can only hope that the next book in the series will be made available in the US as well because I am very eager to meet these characters once again. I like mysteries with lots of twists and turns. This book sounds right up my alley. Great review! I think I’d like this one!